St. Casimir was born at Wawel, the royal Palace in Krakow, and was a member of the Jagiellon Dynasty. 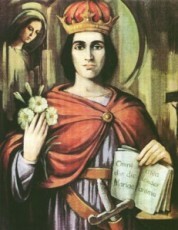 St. Casimir was the third child and the second son of the King of Poland and Grand Duke of Lithuania Casimir IV, and Queen Elizabeth Habsburg of Hungary. A Polish Priest, Fr. Jan Dlugosz educated Casimir and his brother Vladislaus II. He was a strict and conservative teacher who emphasized ethics, morality, and religious devotion. The young princes were subject to corporal punishment, which was approved by their father. Casimir had great oratory skills. When Casimir’s uncle died, the King of Hungry and Bohemia, his father took that post. His father decided to install his son, future saint Casimir in Hungary. After a war effort that took several years in Hungary, resulting in failure, he moved back to Krakow to resume his studies with Fr. Dlugosz. Fr. Dlugosz remarked that Prince Casimir felt “Great sorrow and shame” regarding the failure in Hungary. Polish propaganda portrayed him as a savior, that he was sent by divine providence, to protect the people from a godless tyrant and pagans. This seems to have pushed Casimir into a more religious life in his morals. As his brother Vladislaus II ruled Bohemia, Prince Casimir became crown prince and heir apparent to the throne of Poland and Lithuania. Casimir’s father tried to arrange a marriage with Kunigunde of Austria, daughter of Emperor Frederick III. It is claimed that Prince Casimir refused the arrangement, and chose to remain celibate, sensing his approaching death. He developed tuberculosis, and in May 1483, and he joined his father in Vilnius. There, after the death of the Bishop and Vice-Chancellor of the Crown, Prince Casimir took over some of his duties in the Chancellery. However, his health deteriorated while rumors about his piousness and good deeds spread further. He was well known for his charitable work and help to the needy. In February 1484, King Casimir IV rushed back to Lithuania to be with his ill son. Prince Casimir died on March 4, 1484 in Hrodna, at the age of 25. His remains were interred in Vilnius Cathedral, where a dedicated Saint Casimir’s Chapel was built in 1636. He was canonized by Pope Adrian VI in 1522, and is the Patron Saint of Poland and Lithuania. On June 11th, 1948, Pope Pius XII named Saint Casimir the special patron of all youth. St. Casimir was born on October 3, 1485. He was a Crown Prince of the Kingdom of Poland, and of the Grand Duchy of Lithuania. He was noted for his charity and help with the needy, and turned down the hand of marriage to a Princess. Some say it was because he wanted to remain celibate, and also, he knew his passing would come at a young age. At the age of 24, he came down with tuberculosis. He became more ill, and passed away at the age of 25. He was declared the patron saint of Poland and Lithuania. In 1948, Pope Pius XII named St. Casimir the special patron of all youth.